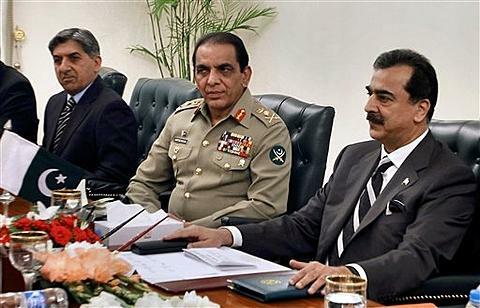 General Kayani speculation about possible military takeover of civilian government is 'misleading,' pledged army will continue to support democratic process Pakistani Prime Minister Yousuf Raza Gilani is welcoming comments from his military chief ruling out the possibility of a coup. General Ashfaq Parvez Kayani said Friday that speculation about a possible military takeover of the civilian government is "misleading." He said such reports are being used to divert attention from "real issues," and pledged that the army will continue to support the democratic process in the country. The prime minister told reporters Saturday that General Kayani's statement is "extremely well taken by democratic circles in the country" and will bring "improvement." Gilani spoke following a Christmas address at a church in Pakistan's capital, Islamabad. His government is facing faces mounting criticism over a secret memo, sent months ago, appealing for U.S. help to prevent a feared military coup. Pakistan's Supreme Court is deliberating whether to order an investigation of the memo. It was allegedly sent in May by a member of President Asif Ali Zardari's office, asking for U.S. military assistance to thwart a possible coup by the country's powerful military and intelligence services following the covert U.S. raid that killed Osama bin Laden on Pakistani soil. Supreme Court Chief Justice Iftikhar Chaudhry on Friday also moved to allay fears about a possible coup, saying a military takeover is out of the question. The existence of the memo came to light in October, when Pakistani-American businessman Mansoor Ijaz wrote a column in the Financial Times newspaper accusing Pakistan's ambassador to the U.S., Hussain Haqqani, of writing the memo and asking for it to be delivered to Admiral Mike Mullen, the top U.S. military official at the time. Haqqani was subsequently forced to resign. Prime Minister Gilani and President Zardari have faced increasing pressure to resign over the memo scandal. Gilani has insisted the military must operate under the control of the civilian government. He said Thursday there cannot be "a state within the state," and that all of Pakistan's institutions are "answerable to this parliament."